Congratulations to the beautiful couple of Cristina and Nate! Their celebration occurred on June 4th, 2011 at the Lake Mary Events Center! 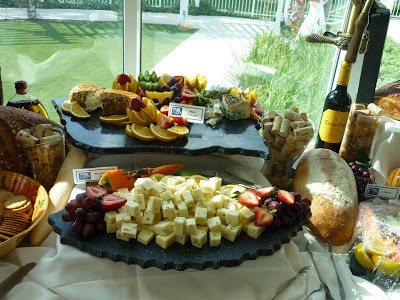 A Selection of Elegant Cheeses to include Monterey Jack, Cheddar, Swiss, and Bleu Cheeses. Garnished with Water Crackers, Strawberries and Grapes. A Mixture of Crisp Iceberg & Romaine Greens with Red Onions, Olives, Tomatoes, Cucumbers, and Shredded Carrots. Served with Big City’s House Dressings including Garden Ranch and Balsamic Italian.